This is my first time to celebrate Valentine’s Day with my fellow bloggers, I was so amazed with the place, seeing different kinds of animals particularly Camels, that you can find usually in other desert countries. So, when the time we arrived at Zoocobia, there are many visitors, some are group of students and teachers that choose Zoocobia as part of their school field trip, some are couple that wants to celebrate Valentine’s Day, some are group of families and friends and why that day was very special? Because Zoocobia have prepared a very entertaining night show. We’ve accompanied by Zoocobia tour guide to show the whole place of Zoocobia and things to do within this place, first stop is at their Bird Thrill which you we experienced feeding their lovable birds of some bird seeds but I'm not the lucky one where birds was able to landed on others palm hands to eat seeds. Second stop is at their Birds Paradise, a close encountered with different kind of birds like Agila, and it was so cool experienced when Parrot landed on my arms and was able to take a pictures with Parrot. Third stop is at their Philippines Pride animals, like bear cat civet and Philippine long-tailed macaque. Fourth stop is at their owned version of Garden Maze, kids goal is to look for their way out. Fifth stop is at their rabbit’s playground, seeing different kinds of rabbit. Last stop is at their Barn, we saw animals like camel, horses, goat, sheep and a lot more. That time I was able to feed goat using the mini feeding bottle with milk. 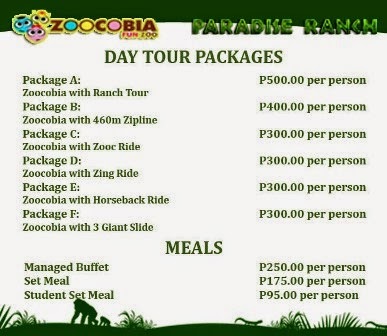 Within the Zoocobia, you will also experience extreme sports like zipline, atv, 4x4 ride and zooc ride. That time we we're not able to experience Zipline, ATV, 4x4 ride that time because they are preparing a show and that time was turning dark in the place I thinks it was already 5:30 pm. After our tour of that day, the Zoocobia team prepared snacks for us bloggers before the much awaited night show of the Zoo. After I ate my snacks, I visited their mini Animal Bone and Skin museum, you will see the skeletal figured of goat, horse, ostrich and others. Then after that, the night show was started and instead of taking photos I've recorded videos of all the shows so that my readers was able to see how Zoocobia team amazed their guests. We may not experience other extreme sports in Zoocobia but we we're able to witness a great shows. And one of the highlights that night was our lighting of lanterns in Zoocobia’s open ground, where you will put your wishes written in a piece of paper inside the lantern before you light up the candle to float away. After that, Zoocobia’s team prepared buffet dinner for all the guests which is included in their packages. Truly now it’s more than words to show how you feel. Give them the best experience this season. For inquiries you may visit our website www.zoomanity.com.ph or contact us at 899-9828 or 899-9808 for you to find love in an unexpected place. You can follow Zoomanity Group in the following social media accounts.